We would like to draw to your attention our wardrobe repairs and replacement services: we are based in the Hale, Altrincham area but can cover other areas such as Sale, Wythenshawe, Bowdon, Hale Barns and even Lymm and the High Leigh area. We can obtain all the necessary parts to carry out any repairs associated with bedroom furniture, in particular repairs to fitted wardrobes, but also to fitted and free-standing dressing room repairs. 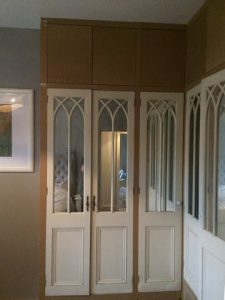 We are noticing these days that there is a big demand for quality replacement fitted wardrobes at very competitive price and we would be more than happy to quote for replacement wardrobes or alternatively for a completely new bedroom layout. We have reliable suppliers of wardrobe furniture including casings and doors of different designs and colors. Before you consider replacement fitted wardrobes we should advice you (and for some reason property owners don’t always realise this) we can quite often make good and repair most wardrobe furniture problems. 7 out of 10 repairs to fitted wardrobes arise from poorly fitting wardrobe doors, broken draw units, snapped hinges, pelmets working loose and similar relatively small items. We can also supply/fit or repair sliding wardrobe doors. We are happy to resolve problems caused by accidental damage and general wear and tear, and we can provide a competitively priced alternative to purchasing new units. So before you consider replacing your existing wardrobe and bedroom furniture give us a call and we will see what we service we can offer you. Whilst we routinely provide repairs to fitted wardrobes and replacement fitted wardrobes to individual property owners we also can also offer wardrobe repairs for landlords and letting agents. In most cases, wardrobe repairs can be completed within a few hours at our customer’s premises. As a AC Joinery there is very little in a property that we can’t fix and repair, so as well as covering repairs and replacement of furniture, repair of sticking doors, window frames and window locks, front door Yale/mortise locks and patio locks we can also provide plumbing, electrical services. In addition, we are experienced in working outside of the property from paths to fencing, from roof repairs to guttering, from drainage to soil stacks, so whatever your needs we can meet them.